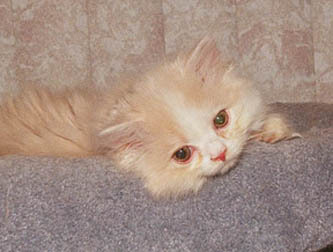 Doobie is a cream tabby and white boy with long hair and straight ears. He is a big, solid boy. He is very active and loves to jump on his siblings. When he's tired, he will find a warm lap to curl up in. 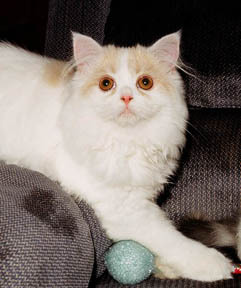 Loki is a cameo tabby and white boy with long hair and folded ears. He is the smallest of the three, but that doesn't stop him from anything! He is a sweet boy, and has attached himself to his grandma Annie. 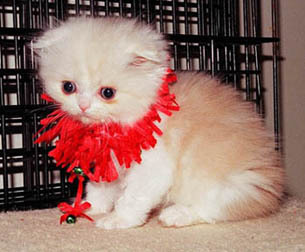 He now lives with Melissa and a feline housemate Freyja. He is fitting in very well. Read about his life now. Here he is with his new mom. Loki's mom's friend - Nadine Brito - made a little video about Loki. You can see it here. 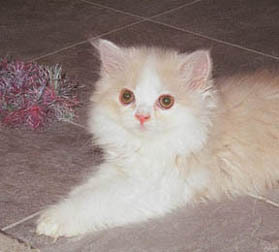 This kitten is a cream tabby and white girl with long hair and straight ears. She has a solid body and a silky coat. She is a very friendly girl, and is the leader of the litter. #1 - Well, it's been one week that we have had our joyful bundle and what a joy it has been. Doobie had settled in as if he has been here forever. His personality is sweet and loving yet playful and tender. 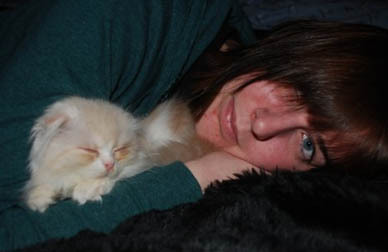 Many times he has come to rest in my lap or on my chest, giving a big sigh of contentment. Bruce is also an equally loved parent as his bonding has been very much the same. Thank you so much for our little boy. He has gone a very long way so far, to healing 2 broken hearts. 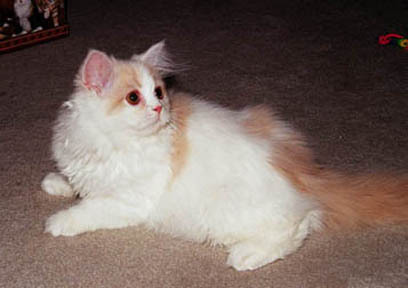 After Mac and now Doobie, I would never want another breed other than the Scottish Fold. What a heavenly blessing! He continues to grow, eats well and loves all of his toys - especially his catnip banana which is almost as big as he is. That's all for now. We have a few pictures and will send them shortly. (He likes to lay in the bowl on our coffee table. What a hoot.) Will keep you apprised and again thanks so much. #2 - As soon as I can find the cord to download from my digital, I'll send pictures. He is hilarious in the bowl and both Mom and Dad have met him several times. He's pretty fearless most of the time and loves to meet everyone who comes in. I gave Dad an hour Reflexology treatment yesterday and he laid in Dad's lap the whole time purring while Dad played with him and stroked him. Made Dad's day for sure. He's a loving little guy. He wants our attention before going to sleep at night so we have playtime on the bed then he gets off and goes under the bed where I assume he is most comfortable. His eyes grow more amber every day and he is growing too. He's such a precious boy. We're having a lovefest at the moment as he's laying under the monitor purring and blowing me kisses. I'll have the camera ready when Dad comes next. That was so sweet. 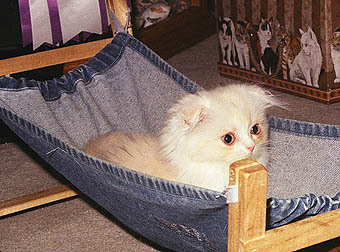 Thanks again for providing us with a sweet and gentle companion. #2 - He sure is a trooper. He also cheers people up great! Our friend was in an accident and hurt himself pretty badly, and all he wanted was to see Loki. :3 Hes very happy. He wasnt to happy after his shot though. His scratcher is his new best friend besides the bed. He thinks he owns the whole bed and we constantly have to relocate him for sleeping time. He actually gained almost a full pound in a week! When we took him in for medicine he was 2.2, and when we took him the other day he was 2.9! Ohh there will be lots of pictures, we take them daily.